Traditional songs from Irish counties, accompanied by some of the best musicians in the land. 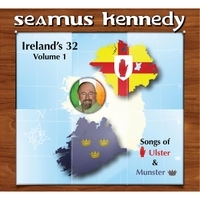 These songs are from the 15 counties that comprise the 2 provinces of Ulster and Munster. 2 are newer songs, but they all feature something about the counties they represent, and several of the finest musicians have accompanied me on them; e.g. Billy McComiskey - accordion, Fred Travers - Dobro, Stevie Morris - Fiddle 7 banjo, Tad Marks - Fiddle, Dan Isaacson - Uilleann Pipes, Rosemary Gano - Flute, Brad Hayford - Bass, Guitar, Mandolin, Keyboards and Whistle. Does your mother come from Ireland? Then this CD is for you.